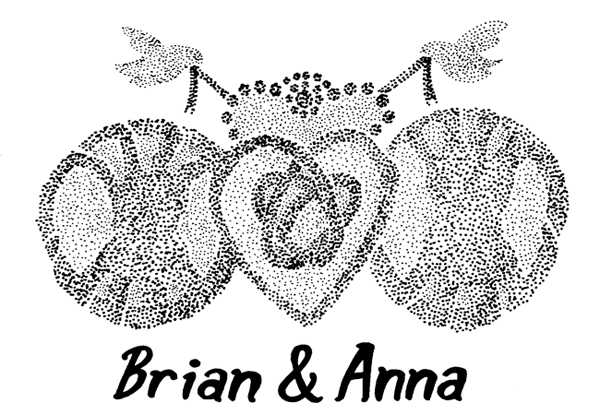 My lovely cousin Anna Lang (sister of Bridget and Melissa) is getting married today to her lovely fiancee Brian Mead today (who recommended Fireball Printing to me). Sadly, I couldn’t be there because of all the stuff that came up with Portland. Really bums me out because she’s the last of the Lang girls to get married, and we Burkes know how to put on a big Irish wedding. I managed to make this piece for them and send it out before I left though. I hadn’t done Pointilism since high school and it was a lot of fun. Has something old (the Trees of Life), something new (their hearts joining in their new life together), something borrowed (the other person’s heart), and it’s sealed in something blue (the blue 8×10 matte I included with this for framing). Congratulations Anna and Brian! Wish I was there! Have plenty of fun in my stead!